His success is just Scary! MOTIVATIONAL – The Scary Guy visited George Pindar Community Sports College to speak to staff and members of the community about his inspirational work. Twenty people including staff, pupils, and local police officers were invited to the event which aimed to raise awareness of Scary Guy’s work in the college and the wider community. Scary Guy has worked closely with the Eastfield school for more than three years and his mission is to eliminate hate, violence, and prejudice. Assistant headteacher Felicity Davis said: “Scary Guy has done so much at George Pindar and we were delighted to have him back in school. “He was talking to various people about what he does and how they can get involved in his work. Miss Davis said since he first started speaking to the pupils, GCSE results have improved by 20 percent and attendance figures have gone up from 80 percent to 92 percent. She said: “He has made a big impact on the pupils and they all love talking to him when he visits. Scary Guy is from Minnesota in America and has worked with more than five million people around the world. His audiences consist of both children and adults within schools and corporations worldwide. He has visited many Scarborough schools over the years and he is well known for his work in improving children’s behaviour. Love for all, Prejudice against none not such a scary idea. We shouldn’t suffer for being different. The two men couldn’t be more different. One sports a conservative shirt and tie and conventional haircut befitting his school principal status. The face and arms of the other are covered in tattoos, his blue hair anything but conventional. Their goal, however, is the same. Zimmerman Senior High-Middle School Principal and The Scary Guy, are striving to foster respect, love, and acceptance of all people. Mike and Scary were best friends growing up in New Hope, but in the past three decades grew apart, as friends sometimes do. “After 32 years we’d gone down separate paths,” said the Principal, “but we’re on the same mission,” which was recently presented to Zimmerman Senior High-Middle students. A former tattoo artist, The Scary Guy believes prejudice threatens the strength of the constitutional right to life, liberty and the pursuit of happiness by all. The Scary Guy travels around the world educating others on the dangers of prejudice. Scary challenged the Zimmerman students to not say anything negative or call anyone a derogatory name for seven days and seven nights. But since we are only human, he added, it is to be expected that slip-ups will happen. When they do, it is important to apologize and make amends. 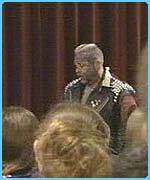 The Scary Guy has worked with people worldwide promoting peace, respect, love, and acceptance of all people worldwide. The word quickly spread. A huge 20 stone man covered in tattoos was in school and something was happening in the main hall. Pupils were already crowding the doors trying to glimpse what was going on inside. Local press were lining up. Photographers appeared in the foyer. Year 7s were the first to meet Scary Guy – a huge Texan tattoo artist whose face was as colorful as his message. The hall was packed with pupils and teachers and others who somehow sneaked in, aware that something extraordinary was happening. And it was. ‘They call me the Scary Guy,’ he drawled in his deep bass American voice. Then he went on to make us laugh, make us think about how we treat other people and how we see ourselves and ultimately challenge us to change our lifestyle, especially our words. ‘Words are powerful!’ he warned. Before he knew what was happening a Year 7 boy found himself right at the front being shown how to hug – man style. We watched, transfixed, wondering if this would turn into some wild wrestling move. The hall resounded with wild clapping as they hugged one another. And the hugging was infectious. ‘Everyone needs 16 hugs a day,’ Scary explained and Lord Lawson pupils quickly joined in the action. Even Mr. Reach had a bearhug from the gentle giant as he volunteered to come forward. The Scary Guy broke down barriers and showed us all how simple it was to make someone else feel good rather than criticise them. He challenged negative mindsets and name calling and showed us all how valuable we all are. His mission? To eliminate anger, hate, and violence. And in true comic book hero style, he succeeded. We laughed, cheered, whistled and joined in the fun. Except, of course, he had a serious message. We won’t forget it. Would this man make you start being nicer to people? That’s what Scary Guy hopes, and he’s going round Britain’s schools trying to teach people how to be nicer to each other. He reckons that if people stop judging others the world will be a better place, and the way he looks is an important part of his master plan. 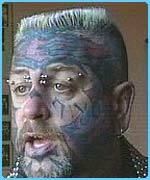 If you see someone covered in tattoos and piercings you’d normally be a bit scared, but if you listen to Scary Guy and think he’s okay afterward, you might not judge people so quickly in the future. He also asks everyone to stop bullying and name-calling for seven days, because he thinks it’ll make you feel loads better at the end of it. And according to Scary Guy, it works. He said some kids he talked to three or four years ago have called him since and said the things he taught them changed their lives.